NARCOPOLIS: Back To The Dystopian Future – Schlockmania! Narcopolis is set in a speculative version of the year 2044 where drug use is legal and the Ambro Corporation has cornered the market on drug manufacturing. There are still drug cops, called “drecks,” who pursue those who are selling or using non-Ambro drugs. Frank (Elliot Cowan) is one such dreck, a grizzled type with a marriage on the rocks and demons of his own. When he turns up a mysterious dead body, he begins to investigate over the wishes of his superiors – and discovers a conspiracy that involves Ambro, a mysterious rebel (Elodie Yung), a hermetic ex-scientist (Jonathan Pryce) and some earth-shattering secret technology. There’s much to like about Narcopolis on the surface level. It’s surprisingly accomplished for a crowdfunded film: director Justin Trefgarne directs with confidence, getting a slick look that fleshes out well-chosen locations that fit the film’s futuristic vibe with subtly-deployed CGI effects. The cast is solid, bringing a suitable level of intensity to their roles, and the story hits all its marks with economical timing. Unfortunately, there is nothing in Narcopolis that a sci-fi fan hasn’t seen before. As the above synopsis should indicate, it doggedly follows every future-cop cliche that has become familiar since Blade Runner‘s entry into the cult movie pantheon. The script, penned by Trefgarne, is needlessly convoluted – complete with a confusing prologue – because it’s trying to hide a twist that kicks in during the final third. Without getting into spoilers, that twist reveals the story is actually a different kind of sci-fi tale. Unfortunately, the new set of beats that the story rolls out are as familiar as the future-noir stuff that preceded it and there’s not enough time left to push them in any new or interesting direction. Thus, Narcopolis is a technically well-executed genre exercise that is undercut by its lack of fresh ideas, a problem that makes its self-consciously serious approach feel unearned. The technical polish shown here suggests that Trefgarne is capable of making better films but he should definitely explore fresher, more adventurous material on the next go-round. 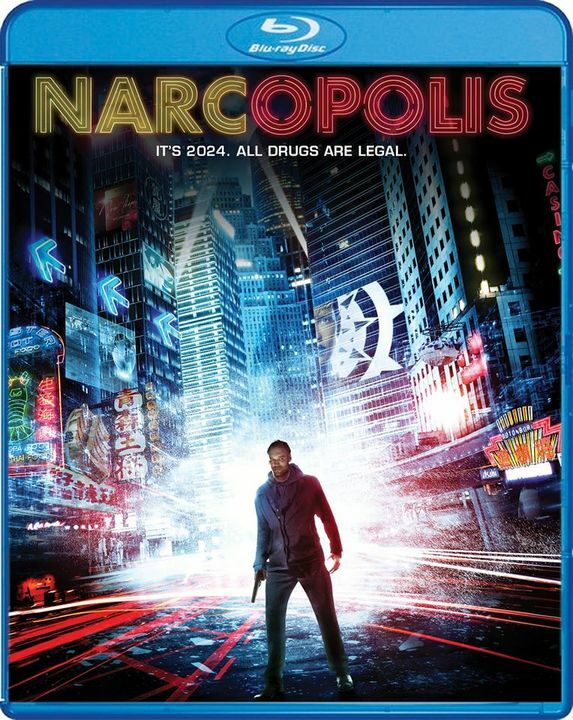 Blu-Ray Notes: Narcopolis has made its blu-ray debut in the U.S. via a new disc from Scream Factory. The transfer does well by the film’s stylized HD imagery. Audio offers both 5.1 and 2.0 lossless stereo mixes and the 5.1 mix is particularly lively. As for extras, Trefgarne provides a solo commentary that covers a lot of bases: storytelling choices, scheduling challenges, how settings were pieced together from multiple locations, memories of working with the cast, etc. There is also a trailer, a deleted scene that offers an alternative ending and a 17 minute making-of piece that features plenty of director and cast soundbites.